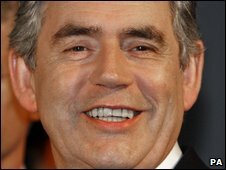 Gordon Brown has revealed that he is partial to a chocolate biscuit, after he was accused of sidestepping a question during an online chat. The prime minister said he had missed a question about his favourite biscuit during the live web chat with the parents' website Mumsnet. He used the social networking site Twitter to reveal that he likes "anything with a bit of chocolate." But he said he was trying very hard to cut down. The PM had failed to respond to repeated inquiries from parents about his favourite biscuit. Mumsnet users speculated that it might be Garibaldi or Nice. Another asked whether he dunked. But Mr Brown left the hour long session with the question unanswered. The PM was more open about his health, after speculation about his eyesight, saying he was "fighting fit". He also answered questions on the government's record on families, childcare, swine flu and expenses. Asked about his eyesight, after No 10 revealed on Sunday he had suffered minor damage to the retina in his right eye, he thanked people for their interest in his health. "I have had one problem. I lost my sight in one eye playing rugby but the sight in the other eye was saved by brilliant NHS staff and there has been no deterioration in my sight since. So I am fighting fit." Mr Brown joins a growing list of politicians to take part in web chats on social media sites aimed at mothers, including Tory leader David Cameron and Lib Dem leader Nick Clegg.